The overnight flight from Chicago to Brussels, Belgium was uneventful, until shortly before landing when the captain announced that some cool winter mist and fog was restricting visibility to about 1,500 meters at the airport. 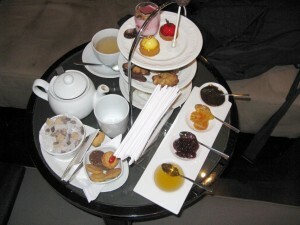 Nevertheless, it was enough for a Boeing 767 to land safely, and I was soon off to my afternoon tea at the Hotel Amigo. 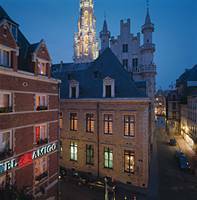 The heart of the city of Brussels is Grand Place (Grote Markt), and if you can’t be directly on the Grand Place itself, the next best thing is to be just off one of the corners – northwest in the case, where the Hotel Amigo is located. This is one of the most desirable locations in Brussels – within walking distance of most of the top sights, restaurants, and historical points of interest. 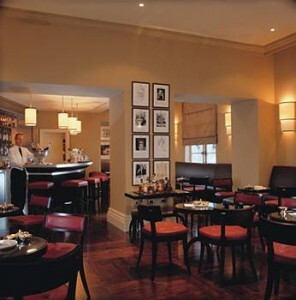 Afternoon tea is served in and around the Amigo Bar, which is a full service bar that provides light meals, cocktails, champagne, wine and beer, in addition to Afternoon Tea. It’s a modern room with large glass windows that permit you to look out onto the city life of Brussels as you enjoy your afternoon tea. Seating is at modern low sofas, low chairs and low tables. It’s not until you reach the end of the extensive bar menu that you’ll find the entry for “Belgian Tea Time,” an afternoon tea served between 3:00 pm and 5:30 pm every day. If you prefer, you can order a spicy hot chocolate, mulled wine or champagne with your afternoon tea. All of the full leaf teas here are from Mariage Freres, the highly respected French tea company, and Belgian Tea Time begins with your selection of one of their 12 teas on the menu. I chose the Darjeeling Imperial, which was brought to my table steeping in a white ceramic teapot. When the three tier tray arrives, you may not notice it at first, but there seems to be something missing. You can’t quite put your finger on it, but then it hits you, “Where are the scones and the clotted cream?” As you’re pondering that question for a moment or two, you also notice that the condiments are a little different. Instead of lemon curd and clotted cream, you are served chocolate sauce and honey. Then the proverbial light goes on – this is Belgian Tea Time, and they’ve replaced the traditional scones course with those delectable, mouthwatering Belgian waffles. And the waffles are, in fact, unbelievably good – my only complaint being that they served small, dainty portions instead of something you could really sink your teeth into. However, if you’re still interested in a full-portion Belgian waffle, there are virtually unlimited opportunities outside the front door to satisfy your craving. The freshly prepared finger sandwiches were made with cucumber, ham and cheese, and smoked salmon, and the sweets included a framboise mousse and a lemon tartlet. Macaroons and speculoos cookies rounded out the sweets course. All in all, this was a very relaxing and delicious afternoon tea with a Belgian (waffle) twist in one of the finest hotels in Brussels. It was my unfortunate luck to miss the piano player in the Bar Amigo that day. 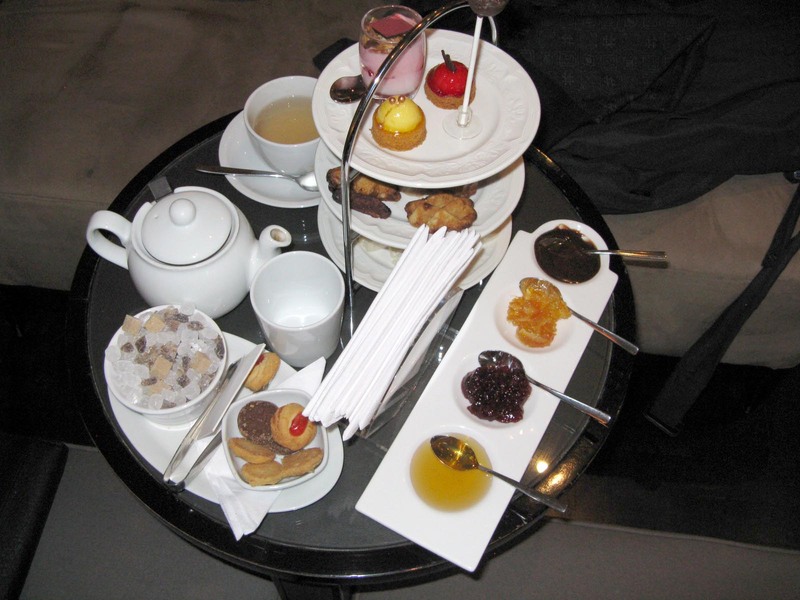 This entry was posted in European Teas and tagged afternoon tea, belgium, brussels, high tea, hotel amigo. Bookmark the permalink. I like the way you structred the post..great job. made it easy to follow!